So Jesus tells the disciples to "Give them some food yourselves." Is Jesus just telling us here to give away more to the poor? We talk about giving food through the St. Vincent de Paul Society, and all the other ways you can give to the poor. That’s a great start. But One Table is something different. 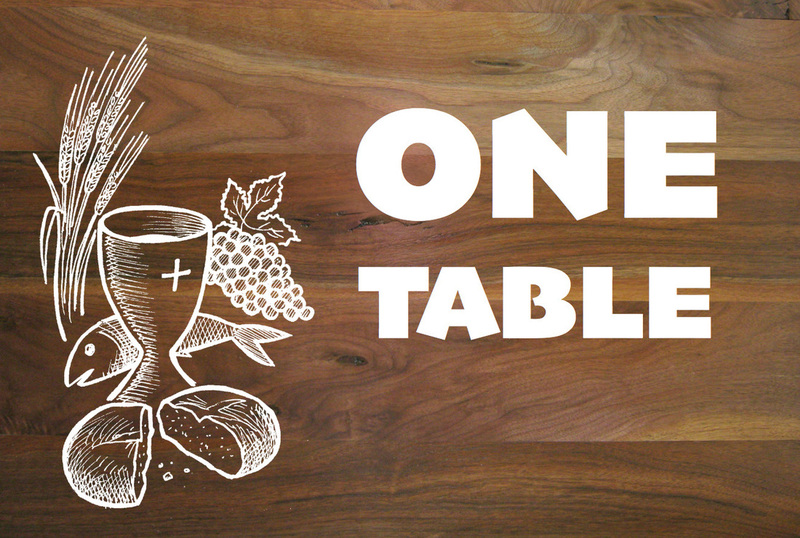 Jesus invites us to put everything on the table. If we don’t have to trust in God or each other, something is missing. This is so hard to do, because we are in a society that is based on fear and protecting ourselves. I was raised to be responsible with my money and to save it up, since there wasn’t all that much with four kids and my dad’s teacher salary. It's not easy to give it away. 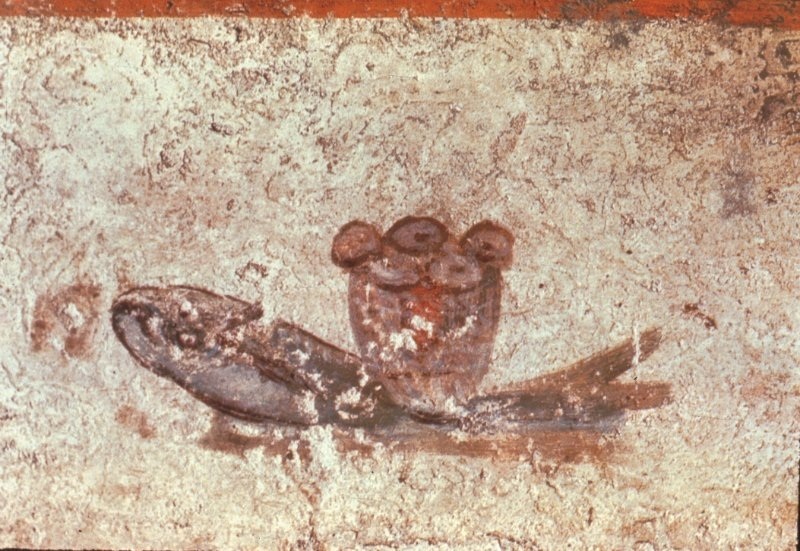 The fish and loaves fresco, Catacombs of San Callisto. When Jesus arrived, he saw this huge crowd. At the sight of them, his heart broke—like sheep with no shepherd they were. He went right to work teaching them. Jesus got them all to sit down in groups of fifty or a hundred—they looked like a patchwork quilt of wildflowers spread out on the green grass! He took the five loaves and two fish, lifted his face to heaven in prayer, blessed, broke, and gave the bread to the disciples, and the disciples in turn gave it to the people. He did the same with the fish. They all ate their fill. The disciples gathered twelve baskets of leftovers. 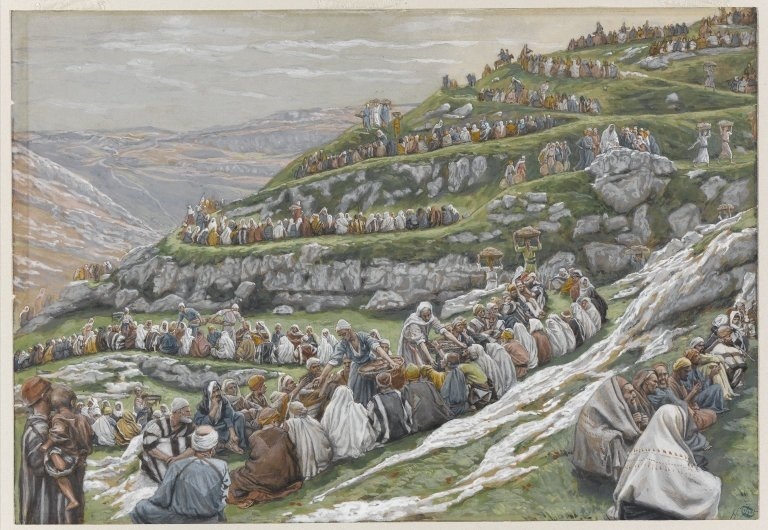 More than five thousand were at the supper. Let Go of something that keeps us from sharing or receiving: Fear, pride, busyness. Clench our money a little more loosely. Connect with family, neighbors, panhandlers: eat with them all. Volunteer with a group that puts us in personal contact with the needy. Learn to Receive: Carpool with workmates. Borrow from a neighbor. May we extend this table, not only in word, but also in action.